Lebanon will head to the polls on June 7 in an election that could alter the political fabric of the country, with Hezbollah and its allies poised to make significant gains. Hezbollah is pitted against the current anti-Syria majority. The robust campaign has split Lebanese voters. 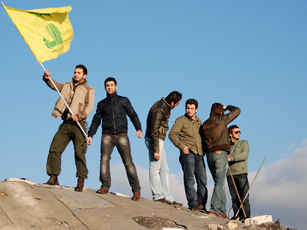 Young Lebanese men wave the flag of Hezbollah. For more on the rise of Hezbollah in Lebanese politics, watch the Worldfocus signature story: Hezbollah heads into mainstream Lebanese life and politics. On a visit to Lebanon in late May, U.S. Vice President Joe Biden — the highest-level U.S. official to visit Lebanon in over two decades — warned that U.S. aid would be dependent on the outcome of the elections. Hezbollah is backed by Iran and Syria, while the U.S. and its allies support the current parliamentary majority, who came to power in the previous election after Sunni leader and former prime minister Rafik Hariri was assassinated in 2005. Worldfocus.org’s weekly radio show examined the issues and implications of Lebanon’s election, looking back to the country’s turbulent history and forward to a potentially new political landscape. Ben Gilbert is the Lebanon Correspondent for GlobalPost. He also works as an independent radio, newspaper and magazine reporter covering Middle East news, culture, conflict and economics. His work has aired on National Public Radio, the Canadian Broadcasting Corporation, BBC and ABC Radio, among others. He has also written for the U.S. News and World Report, The Christian Science Monitor and The San Francisco Chronicle. Ghassan Schbley is a scholar and project associate with RAND based in Washington. He specializes in Lebanese and Middle East politics and U.S. relations in the region. View videos and blogs from the Worldfocus series The New Lebanon. Associated photo courtesy of Flickr user Paul Keller under a Creative Commons license.